It was deceptively beautiful outside today. One might have seen the blue sky and sun shining and thought it was spring, but everything was frozen over. 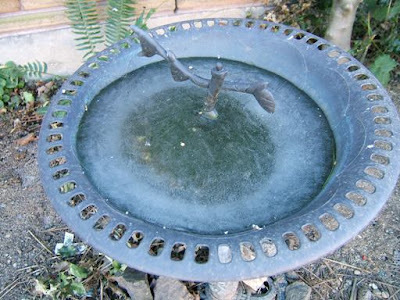 This is a birdbath I walked past today. It conjured images of teeny birds in teeny ice skates. January 26th, 2008 - Melissa! January 23rd, 2008 - "Love?"